Most Grad Nights choose to hire vendors to provide services, games, and/or entertainment. Whether your Entertainment Committee decides to contract with one vendor or twenty vendors, the problems remain the same. Here are some suggestions that might make the determination, selection and hiring of vendors easier. Word to the Wise: Once you have laid the proper groundwork, call and secure your vendors for services and entertainers as soon as possible. Make sure they sign and return the contract to you. What services/entertainment will the budget allow? If your committee does not have a large budget, then you must prioritize your "wish list." Shop around for the best deals. If you survey your graduates, make sure you cover their wish list to the best of your ability. What entertainment is the most popular with this year's class? What entertainment do your community, school board and superintendent consider inappropriate? Did last year's committee already commit to any vendors, verbally or otherwise? Many Entertainment Committees run into a problem with vendors because they didn't check with last year's Entertainment Chairperson. Popular vendors may receive a verbal commitment at the end of last year's event for the following year. A verbal commitment can be binding. Long-term working relationships may be destroyed when a vendor holds a date for your school and you do not use them. Review the entertainment performance reviews from the past Grad Nights. Contact Gradnight.org website (www.gradNight.org) for vendor information. Word to the Wise: The Grad Night liability insurance will typically NOT include any hired vendors. Each vendor must carry separate insurance. Carefully check your insurance policy. Find out who is eligible to sign vendor contracts, e.g. PTA president, Grad Night chairperson or both. Once you sign a contract recognize that it is legal and binding. Don't try to get out of it because you found a better deal. Don't try to get out of it by claiming that you're "just a volunteer" and you made a mistake. Those excuses don't work. When shopping, have only one person call each vendor. It is confusing, time-consuming, and frustrating for the vendors to receive calls from several different persons all claiming to represent Grad Night and asking the same questions. If members of your committee feel they need to hear the explanation personally, write down the questions and ask for a written response from the vendor or assign one person the task of getting the information. Read through all notes and contracts from the previous year before you begin calling vendors. Take advantage of the vendor's knowledge, experience and expertise. If this is your first Grad Night party, use your vendors as a resource. They work with their equipment all the time. 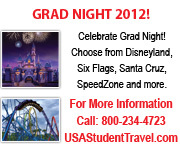 If they have done Grad Nights before, they typically know what the graduates will like and won't like. Remember, most Grad Night volunteers are not professional special event planners. Find out how much space and electrical power is required for each piece of rental equipment. This includes equipment your vendors will bring. Check with the site superintendent to ensure there is sufficient space and electrical capacity. Confirm your vendors carry liability insurance (See the section on Insurance). Obtain a copy of their insurance verification form for your specific event (at least 90 days prior to your event). Ensure the vendor verification form identifies your Grad Night and your site facility as "additionally insured" on their policy. Some vendors "subcontract" games to other vendors. Ask your vendor if they intend to subcontract any games or entertainment. Ensure they understand that you require insurance verification forms for all games and entertainment, not just the games owned by the primary vendor. Ensure your Grad Night committee has liability insurance coverage (see Section 4, Insurance). 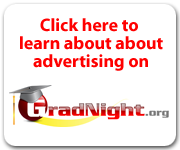 Resolve the use of Grad Night volunteers assisting the vendor games and entertainment. Ensure it is clear that the Grad Night volunteer will only "assist" the vendor (such as crowd control). Do not allow Grad Night volunteers to become "responsible" for vendor games or entertainment. Check to ensure vendor games and equipment will not damage the site facility. Wooden gym floors can easily be damaged. Does your facility require you to cover the floor area? Stipulate in your contract how the vendor's employees must be dressed. Clothing with obscene or substance-related logos or slogans should not be allowed. Stipulate in your contract the conditions for vendor employee rest breaks. Most Grad Nights require the interactive games to be continuously operated without a shutdown. Ensure your contract is clear and that the vendor will provide sufficient people to allow employee breaks without equipment shutdown. If a piece of equipment requires a graduate to be strapped or harnessed in, ensure a female vendor employee will be available to help the female graduates. Ensure the vendors and their employees provide identification (such as photo identification) to confirm they are in fact employees of the vendor. Comply with all Fire Marshal rules and insist upon vendors doing the same. This includes the type and size of extension cords to the vendor games. All games and materials must meet Fire Marshal standards. Before the contract is signed, schedule a time to meet (possibly at the site of your party) to discuss expectations from both sides. This will help eliminate misunderstandings about who agrees to provide what items, (how many of each, what sizes, how long, etc.). Determine if there is a setup and breakdown time. Is the setup/breakdown time part of the contracted time or do you pay from the time they start performing? Determine is they are available to stay longer if they are popular with the attendees and at what rate? Establish in the contract the amount of deposit, and how and when the final payment is to be made. Advance deposits are typically 25% of the total contract price. Ensure your contract specifies the conditions for a refund if you need to cancel or if they do not provide the service as agreed in the contract. Provide the vendors with an easy-to follow map to the event site and directions for convenient unloading of their equipment. Where do they offload their equipment and park for the night? Provide vendors with a floor plan of the facility where the party will be held. Let them know where they will be setting up. Ensure the vendors provide you with the exact requirements to set up and operate the games/entertainment including space, type of floor surface, and electrical power. Provide the vendor with your home phone number as well as a back-up phone number of another committee member. Ensure they have the phone number you can be reached at the night of the party in case of an emergency or if they get lost on the way. Ask to see a video of past performances (if available), to ensure their act is appropriate for a teen-age audience. Contact Gradnight.org (www.gradNight.org or 1-800-60GRADS) if you have questions regarding vendors or if you need additional vendor names and numbers. The goal is to get your vendors/services under contract early. Ensure your contract is clearly written so you can minimize problems between yourself and your vendors. Clearly mark the way for off-loading for vendors using large easy-to-read signs. Be on hand to greet your vendors. Provide the vendors with a list of your services that evening (food, telephone, restrooms...). Introduce your vendors to your "on site" coordinator who will provide them with help in case of an emergency. Have large, fun; clear signs at each entertainment area to ensure the graduates can easily find each artist, game, or activity. Provide stanchions for crowd control where appropriate or necessary. Have your final payment check ready to give them after they complete their work and you verify everything was satisfactory. If there are problems, tell the vendor immediately and put your comments in writing. Double-check your accounts with the Treasurer to ensure all vendors have received final payment. Have copies of each account paid and pass them on in a committee folder for next year's Committee Chairperson in case any vendor comes back with unpaid account complaints. Send thank you notes to all vendors. Vendors really appreciate this and use quotes from these notes in their advertising. They may also be more inclined to give the next year's committee a price break. Critique each vendor's performance. Include how well the services were received by the students. Provide vendors with feedback about their services. A letter with constructive comments helps them improve their services for next year. Give next year's chairperson your home phone number so they can call you with questions. Tell your replacement about any commitments you made for next year.